CasinoEuro is known for its particularly large selection of highly entertaining games. Upon joining the member area, the players can launch classic casino games as well as new titles. The casino informs the vistor that it provides the highest winnings. The nice thing is that the player is not isolated. It is possible to enjoy the games in the presence of live dealers, which only adds to the excitement. The promotions section has some really big bonuses. In fact, it would be a good idea to take a look at them. The CasinoEuro Bonus deal offer includes the standard Welcome Bonus. 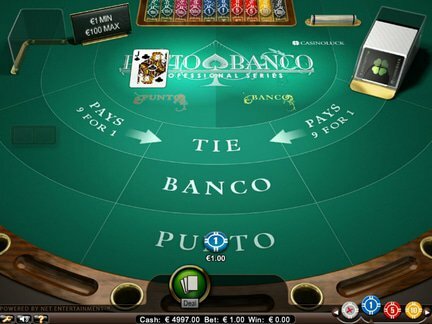 As part of the deal, the player can deposit €150 and end up playing with €300. This deal makes it possible to double the first deposit. Making a deposit can also be rewarded with extra free spins with the Weekend Spins promotion. Furthermore, the website offers an opportunity to take various trips. For example, Aloha! Cluster Pays players are eligible to win a trip to Hawaii. However, the deals of that sort only show up occasionally. Therefore, it is important to follow the promotions page in order to stay updated. The casino boasts about the fact that it has close to 100,000 players and the list keeps on growing. It has also paid close to 39,000,000 in jackpots. It even specifies the number of players that have achieved a piece of the pie. Right now, it looks as if 8800+ players have won prizes on the site. It is quite easy to register and become a member. In order to start enjoying the benefits, the player only needs to provide a few basic details in the sign-up form. Casino Euro supports speakers of eight languages. Here are the supported languages; English, Czech, German, Dutch, Norwegian, Polish, Swedish and Finnish. Furthermore, the website specifies who is allowed to play on the site. The players from the following countries are excluded; Belgium, Denmark, Estonia, Hungary, Italy, Latvia, Portugal, Romania, Spain, Turkey, United Kingdom, United States of America, etc. 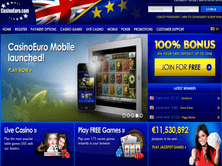 The support for the € currency demonstrates the casino's commitment to European players. The favourites game section displays the popular titles. This section would include the following titles; Mega Moolah, Starburst, Gonzo's Quest, Twin Spin, Guns N' Roses, Aloha, MegaJackpots Isle O' Plenty, Cloud Quest and Nordic Heroes. The games are divided into several key categories. The fans of slots will likely appreciate the fact that the casino offers games like; Sun Tide, Wild Orient, Bikini Party, Samba Carnival, Mega Fortune Dreams, Lights, Pyramid Quest for Immortality, Hall of Gods, GLOW, Non Staxx, Rage to Riches, Spin and Win, Fruit Shop, Flowers, Mr Toad, Sparks, Master of Mystery, Wizard of Gems, Dazzle Me, Eye of the Kraken, Xmas Joker, Steam Tower, Ring The Bells, Thunderfist, Parls of India, Rocky, Jewel Box, Wonder Woman, Super Lucky Frog and Tales of Krakow. It is also possible to check out games from these categories; Jackpots, Video Poker, Table Games and Live Casino. There is some minor criticism of the bonus & free spin offer. Other than that, the casino is actually seen as an above average venue by players. Since the casino has been around for quite some time, the high player ranking is an achievement for the venue. The help section offers live chat, which allows for an easy exchange of information between the players and staff. There is also e-mail and phone supoort. BML Group is the operator of the website. This company is registered in Malta. The license comes from the Malta Gaming Authority. This authority is highly reputable. Unlike other online casinos, the venue has chosen to stick with a trusted licensing body. The casino itself was established in 2002. It has managed to grow and expand in its influence over the years. A quick glance at the CasinoEuro game offer reveals that the website can easily satisfy the needs of players. I was entertained by many of the games on the site. I was also glad to see so many language support options. When it comes to the bonus deal offer, I was impressed by the welcome bonus. At the same time, I would definitely like to see a few more deals in that section. Since I've enjoyed my stay at the online casino, I could recommend the venue to others.